With such an abundance of dive sites along Sydney’s coastline, scuba diving in the Sutherland Shire is often overlooked, and many divers remain unaware of the pristine reefs and stunning marine life just 20 minutes further south from some of Sydney’s most popular sites. Whether you’re an experienced diver or someone looking to try scuba diving for the first time, you will be blown away by the diversity of marine and coral life that calls the Shire home. 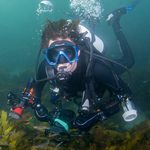 Like many other scuba divers, I have felt the tight grip of the ‘local’ dive site; the incessant need to continually dive the same locations week in, week out. While it provides comfort, looking under the same rock for the same fish every time you dive strips away the sense of exploration and adventure that got you so hooked on the underwater world in the first place. More concerning though, is that without exploring new sites you are likely unaware of what else is out there. From an abundance of rare species of marine life to vibrant coral gardens, the Shire without a doubt has some of the best and most accessible diving in New South Wales. These vast coral gardens are a cornerstone of the Shires underwater beauty, with dive sites such as The Monument, The Steps and Oak Park featuring some of the most colourful and vibrant coral life that I have seen outside the Great Barrier Reef. These immense and lively coral gardens not only span the entire length of the dive site, but also serve as a shelter to an array of fish species, cuttlefish, octopus, starfish, rays, Port Jackson Sharks (don’t worry they don’t bite! ), nudibranchs and seahorses. The coral gardens alone are reason to explore the Shire’s underwater world, but if that’s not enough already, the Shire is also home to one of the largest populations of Weedy Sea Dragons in the world. The only place on Earth to find these beautiful and rare animals is in a few locations in the southern parts of Australia, The Steps and The Monument at Kurnell being two of them. Better yet, the population size at these dive sites is simply astounding! On one dive at The Monument my dive buddy and I encountered 7 Weedy Sea Dragons and I wouldn’t dare count the number we swam right past. While there are particular places to look and techniques that will assist in finding Weedy Sea Dragons, It speaks volumes about the Shire’s marine life that I have never entered the water at Kurnell and not found at least one of these beautiful animals. If you’re after more details on how to find these animals, including dive site maps and other site information check out the see and do page here. Irrespective of how good the dive site is, diving in swell is never fun or advisable, and while Sydney has an abundance of dive sites, many of these are exposed and vulnerable to swell. Not only is Shiprock at Port Hacking a fantastic dive site, but it is also one the few locations in Sydney protected from large swells. More impressively, unlike majority of other similar locations commonly known as ‘muck dives’, Shiprock has a relatively deep wall that is covered in sponge gardens, overhangs, dense fish life, and is littered with cuttlefish. If you’re a fan of rare fish, Shiprock is also a common place to spot the infamous Pineapple Fish. Provided you enter the water at high tide, Shiprock is one of Sydney’s best harbour dives, and a location worthy of a spot on your diving bucket list! For those looking to try scuba diving for the first time, the diving schools in the area are among the most affordable in Sydney and offer some of the best diving education available. And if I haven’t mentioned this already, the dive sites you will be training on are some of the best in NSW! Abyss Scuba Diving is a fantastic school with prices starting at $149 for the PADI Open Water Course, with additional options available if you decide you want some additional more personalised training. St George Underwater Centre is another great school with prices for the PADI Open Water starting at $199, and similarly they offer more personalised courses and even one on one courses for those who may feel less comfortable in the water. The quality of training in both cheaper courses is exceptional, but the flexibility offers those who are a little more nervous in the water the ability to get some more individualised training. Once you’ve finished your few days of diving in the Shire and you’re feeling confident beneath the surface you’ll have the added benefit of your Open Water Certificate. This will allow you to scuba dive anywhere in the world! So whether you’re an experienced diver or not, I urge you to take the plunge and explore the Shire’s underwater world! For more detailed information on each of the sites mentioned above click here.